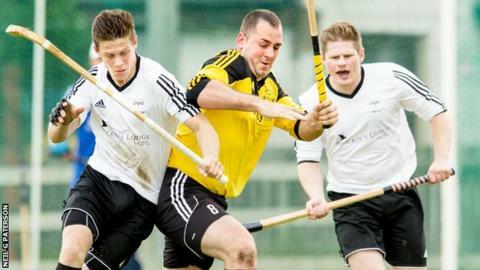 Lovat won through to meet Inveraray in the first semi-final of the SSE Scottish Hydro Camanachd Cup on 8 August with a 2-0 replay victory over Fort William at An Aird. The race for the Marine Harvest Premiership title drifted closer to becoming a two-horse affair following wins for both Kyles Athletic and Newtonmore. Leaders and champions Newtonmore made unexpectedly heavy weather of a 1-0 success at Kingussie in the televised Friday night game while Kyles sustained their challenge with a 6-1 away win over Lochaber. However, Glenurquhart are still also thereabouts after leapfrogging Lochaber into third place with a 4-2 defeat of Inveraray at Drumnadrochit. At An Aird, Callum Cruden put Lovat ahead just before the quarter-hour but, despite Fort's Stevie Smith being sent off soon after, were unable to breathe much more easily before the 70th minute when a James Tangey own goal put the tie beyond Fort's reach. Lovat will return to An Aird for their semi-final against Inveraray while a potentially titanic clash between Newtonmore and Kyles in the other tie at Taynuilt will take place on 15 August. More and Kyles also kept their league challenges on track with two more points each. But in pouring rain at the Dell, Kingussie, who had lost four in a row, presented their local rivals with a stronger challenge than many had predicted. Indeed it took Glen MacKintosh almost until half-time to put the only goal of the game past Kingussie keeper Craig Dawson, who played a starring role for the home side. It was plainer sailing for Kyles against a Lochaber team that have been doing well after only being saved from relegation by league reconstruction. Gordon Whyte, Robert Zavaroni and Roddy MacDonald all got two each for Kyles while Stuart Callison pulled the half-time score back to 2-1 with his response. The results leave five-time champions Newtonmore on 20 points from 11 games, Kyles on 15 from 10 and both sides on the same goal difference of 28. Neale Reid opened for Glenurquhart and Fraser Heath quickly took it to 2-0 before Inveraray's Lewis MacNicol made it 2-1 in the second half. But within two minutes Andrew Corrigan got Glen's third and then Reid got his own second to make it 4-1. Euan McMurdo grabbed another for Inveraray late on. Glen sit beside Kyles on 15 points but with 12 games played, while Inveraray stay in the relegation play-off place and just a single point clear of Oban Camanachd, who now have three games in hand. In the National Division, Kilmallie lost their 100% record with a 1-1 draw away to Caberfeidh, who scored first through Liam Symonds early in the second half. It took Kilmallie just one minute to equalise but they could go no further. Both Kilmallie and Skye, whose home game against Beauly was postponed, have dropped a single point, although Skye are one game and hence two points behind.